This black bean soup recipe can be used in the crock pot using dried beans or you can make it on the stove top. 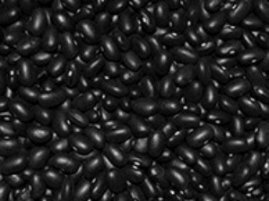 Overnight Method for the Beans: Place the dried black beans in a bowl and cover with cold water. Let beans soak overnight. The next day, rinse them well with cold water. Right-Now Method for the Beans: In a pot, cover the beans with hot water. Bring to a boil and cook for two minutes. Turn off the heat, cover and let sit for one hour. Drain, rinse them well with cold water. In a pot, add the beans, chicken broth, bell peppers and onion. Bring to a boil, reduce heat, cover and simmer for 1-1/2 hours. You may add a whole carrot to reduce gas later on when eating. Add the garlic, chili powder, cumin, salt, pepper and hot sauce (if using). Stir to mix, cover and continue simmering until the soup has reached to desired thickness; 30 minutes for thin soup and 60 minutes for thicker soup. Remove carrot (if using) and serve in a bowl with any toppings you like. After rinsing the beans with cold water (after soaking overnight), place in the crock pot and cover with chicken broth. Cook on high for 4-1/2 hours and add the garlic, chili powder, cumin, salt, pepper and hot sauce (if using). Cover and cook another hour on high. Place soup in pot on the stove. You may now reduce it down to the desired consistency you are looking for. Remove carrot (if using) and serve in a bowl with any toppings you like.